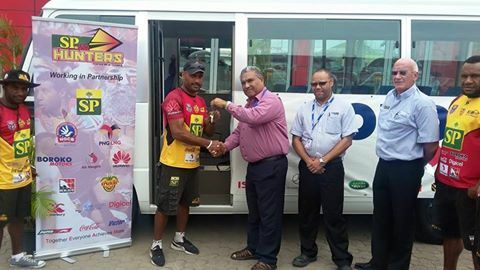 After registering two away wins in the opening rounds of the 2016 Queensland Intrust Super Cup Competition the SP PNG HUNTERS got another reason to smile today after support sponsor Boroko Motors presented the Hunters team with a brand new 25 seater bus. SP Hunters CEO Mr. Bob Cutmore acknowledged the continued support of Boroko Motors and said “Boroko Motors is another vital member in the Hunters family of sponsors as they have been there from the beginning. This bus is named Rosa and will certainly lift the spirits of the Hunters morale heading into this weekend’s match against the Tweed Head Seagulls." The Hunters take on the Seagulls tomorrow at the National Football Stadium (NFS) at 6:30pm and tickets can be purchased at all stop and shop outlets. Gates will open at 3:30pm with a women’s game between Paga Panthers and Tarangau to be played as the curtain raiser at 4:40pm.